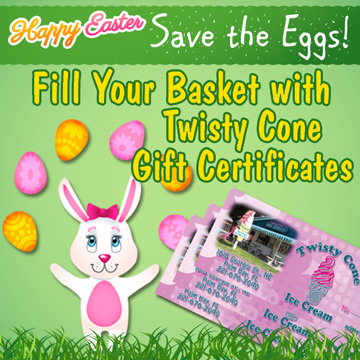 Twisty Cone Ice Cream & Cakes serving Palm Bay since 1982! A Palm Bay Favorite Since 1982. Banana Splits, Cakes, Pies & More. A Brevard County Icon for over 30 Years! Custom Made Ice Cream Cakes for Any Occasion! A Gift Everone will Enjoy! 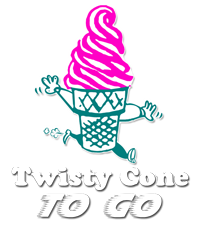 Since 1982 Twisty Cone Ice Cream has been serving soft serve ice cream with pride to Palm Bay residents....and Melbourne, Malabar and Sebastian too! Our family-owned shop has a hometown feel from our walk-up window service where a big smile and friendly staff awaits you to our grassy picnic areas. Come and relax, sit on a picnic table and enjoy your favorite ice cream treat. We love serving ice cream cones, sundaes, Hawaiian Shaved Ice, hand-made shakes and banana splits and seeing our guests' faces light up and grin with anticipation! We boast over 40 flavors of soft serve ice cream including Bubblegum, Strawberry, Peanut Butter, Oreo and Butter Pecan. Can't decide? 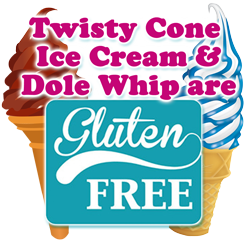 Try layering 2-5 flavors on the same cone! We use only the best ingredients and constantly introduce new items to entice and surprise our guests. Everybody has a favorite treat ...and if it's not on our menu, just ask and we will gladly make it for you. We welcome a challenge! Our ice cream cakes, pies and novelties are second to none. Wemake them fresh and on the premises daily. Once you have tasted our cakes and pies, you won't go anywhere else! Try our Gourmet Candy Cake or Oreo Arctic Swirl Pie....we put the "special" in special occasions like birthdays, graduation, Valentine's Day...etc. We also make ice cream sandwiches, chocolate chip cookie sandwiches and specialty sandwiches such as Mint Chocolate Chip and Heath. Yum! We've been a Palm Bay icon for over 30 years and plan on being here at least another 30! See you there! Twisty Cone Ice Cream Cakes are made fresh, with our Ice cream, in our shop, every day. Our most popular cake is our 8” Double…It is double the height of our competitors’ cakes and boasts 4 layers of chocolateSponge Bob Ice Cream Cake and vanilla ice cream with our Chocolate crunch between each layer. It is truly unique in its size and taste! We have 8” single and double cakes ready to purchase all of the time. If you would like your cake custom decorated or a larger size, please give us at least 2 days notice. We can custom decorate your cake…just bring us a picture or an idea.We also carry over 50 different Edible Images for licensed characters such as Disney, Barbie and Sponge Bob. Just have your Cake Club Card stamped each time you purchase an ice cream cake or pie and receive a FREE 8 inch cake after you fill your card. We'll Have it Ready for You! Copyright © 2018 TwistyCone.com. All rights reserved.